People with significant speech or language problems rely on AAC to supplement speech or to replace existing speech that is not functional. AAC is most often used in combination with speech to maximize functional communication. Comprehensive evaluations are conducted to determine which communication needs are not being met. Clients, who already have received an AT assessment/evaluation at another location, should send the report with the UCF case history form to the Communication Disorders Clinic. This will provide information about whether additional evaluation procedures need to be completed. In addition, clients need to send any relevant school or medical reports from previous AT assessments/evaluations. Treatment options to maximize the effective use of AAC in the everyday lives of children and adults are offered. All services focus on matching individual communication skills, needs and priorities with appropriate technology. 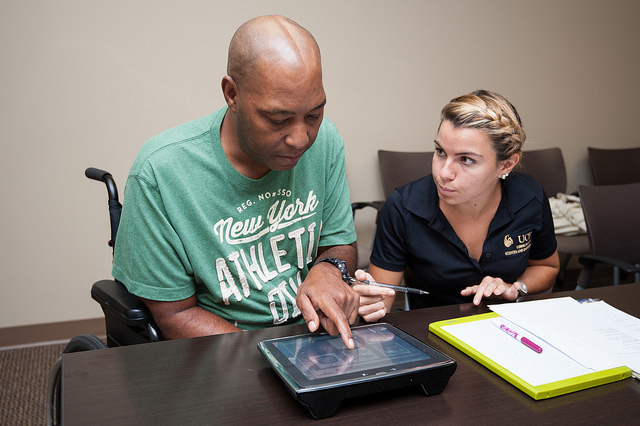 The Communication Disorders Clinic, in partnership with the FAAST Atlantic Region Assistive Technology Demonstration Center, offers services designed to assist those with communication needs. Services are provided by graduate speech-language pathology students and clinical faculty members who are distinguished service providers as well as dedicated teachers and researchers who prepare the next generation of speech-language pathologists.